Fat Fillers: Transfer Fat to Breasts, Wrinkles, Buttocks, etc. Fat fillers are a popular way to plump up thin lips, hollow cheeks, and wrinkles. These procedures use the patient’s own excess fat which is removed from an area of the body via liposuction surgery before being injected into the face or other parts of the body such as buttocks or during breast augmentation procedures. This is also known as autologous fat transfer. One benefit of this treatment is that because the cells originate in the patient’s own body, there is zero risk of an allergic reaction or of the body’s rejection of the injected material. Though fat fillers may be used on adults at any age, they are most popular among people 30-65 years old who are looking to reverse the signs of aging. 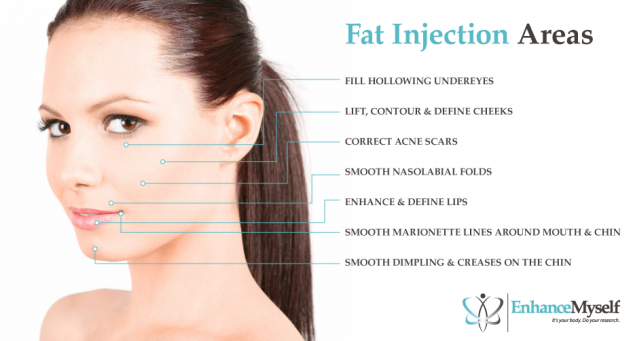 Fat fillers may be used to enhance the cheeks, augment the lips, or smooth facial folds such as the ‘smile lines’ running from the nose to both corners of the mouth. In order to undergo this procedure, you must have excess fat on another part of your body that can be removed in order to create the injectable fat solution. Fat filler injections and fat transfer procedures are performed in the doctor’s office. First, the injected fat is harvested from the patient’s own body. The doctor will use a syringe or cannula (a thin tube connected to a suction device) to remove the fat cells. This procedure, known as liposuction, may remove only the fat needed for the injection or it may be performed to sculpt the area removing a larger portion of excess fat. The fat is typically removed from areas such as the buttocks, thighs, or stomach. Then, the needed fat cells are purified to prepare them for injection. This process usually takes about a week. The patient will be asked to return for another visit at which time the fat will be injected into the targeted area. To perform the fat injection, the doctor uses a thin needle to inject the fat into the skin to treat the targeted areas. This procedure may take anywhere from 30 to 90 minutes depending on the number of injections needed to achieve the desired results. Patients are free to leave the doctor’s office as soon as the procedure is complete. The risks include uneven skin texture, scarring, and infection. The transplanted fat cells require a blood supply in order to supply in their new location; as a result, some of the fat cells can be expected to die shortly after the procedure. Because of this, the results of this treatment are less predictable than with other facial filler options. The treated area may appear underfilled or overfilled, depending on how many of the fat cells remain in the targeted area. After the procedure, you may experience swelling, bruising, and redness, usually persisting for less than a week. Most patients return to work within a few days, while many other daily activities can be resumed immediately following treatment. There will be a ‘donor site’ on your body that must also heal, in addition to the treated area. This area may require a dressing or bandage and may be bruised or swollen. Initially, the treated area may appear ‘overfilled’ to account for the portion of injected fat cells that will be reabsorbed by the body soon after treatment. The results of fat injections are evident within a week of treatment and can last up a year. DID YOU HAVE FAT INJECTIONS? Fat fillers cost $500 and up, depending on the extent of the procedure. Because it is more complicated and time-consuming than other dermal filler treatments most patients’ procedures actually cost in the $2,000 to $4,000 range. However, many patients find it to be well worth the cost, as fat fillers can achieve some of the most natural-looking results possible. Your doctor may offer financing or a payment plan if you wish to spread out the cost of treatment.